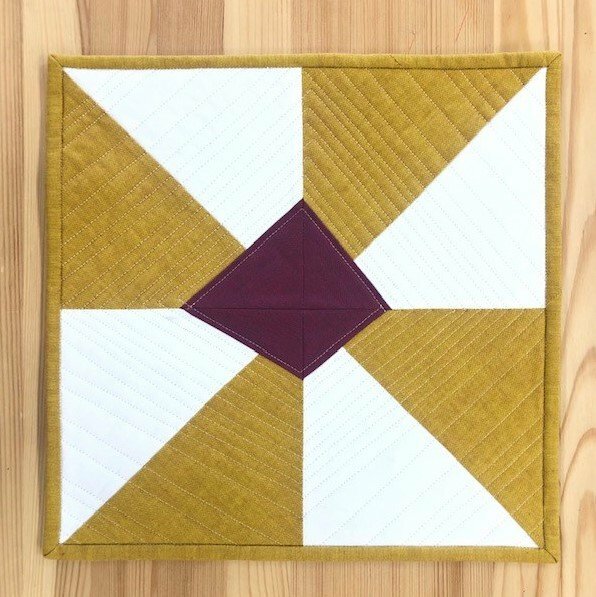 Join us to make Block #5 in our year-long Block of the Month Program, the Switchback BOM designed by Meg Fahrenbach of Tea & Brie, exclusively for us! The May block is the perfect mix of precise cutting and accurate sewing by revisiting Half-Square Triangles. That precision is then placed on the back burner with the introduction of an improv pieced kite at the pinwheel's center. A marriage of precision and improvisation! In addition to receiving thorough instruction on piecing and assembling the block, students will have ample work time to make significant progress on their block under the supervision of the instructor. 1. Switchback BOM May Pattern - available for purchase exclusively in our shop beginning mid-April. BOM Club Members receive the pattern FREE!